Francesca Geraci arrived at Painesville, Ohio, between 1898 and 1900. She arrived in Painesville with her husband, Francesco Dolce, and their children. 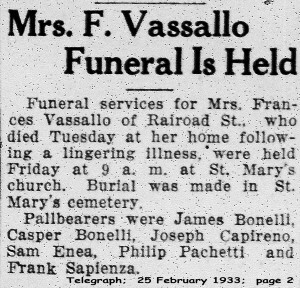 In America, Francesca Geraci was known by her married name, Frances Dolce. Her husband, Francesco Dolce, passed away in 1904. 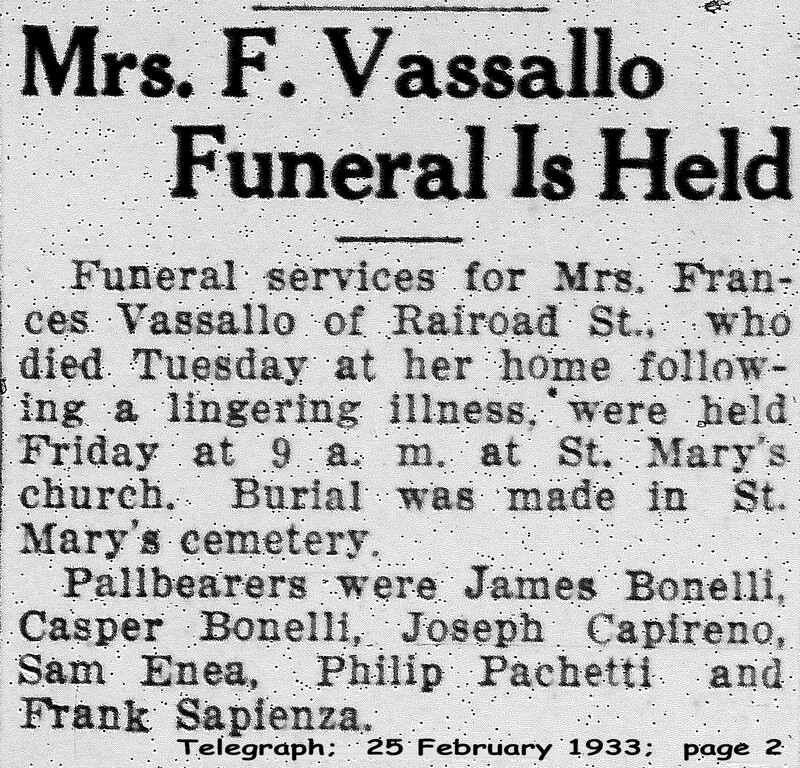 She remarried about 1909, and was then known as Frances Vassallo. Francesca Geraci, daughter of Filippo Geraci, was born on Monday November 4, 1878, at Montemaggiore Belsito, Sicily. She married Francesco Dolce about 1895 in Sicily. After Francesco passed away, she married second, Giovanni Vassallo, son of Antonio Vassallo, about 1909. 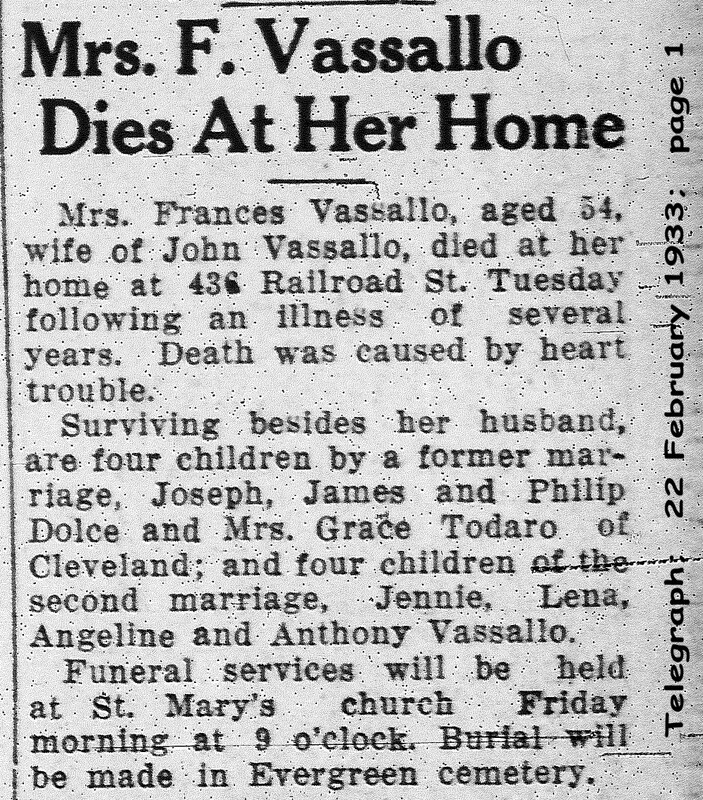 Francesca died on February 21, 1933, at her home, 436 Railroad Street, Painesville, Lake County, Ohio, at age 54, of heart failure. Her body was interred at St. Mary Cemetery at Painesville Township, Lake County, Ohio. Francesca Geraci, age 17, immigrated to the United States on April 22, 1896. She was traveling to Buffalo, New York, with her husband Francesco Dolce, who was returning to Buffalo. 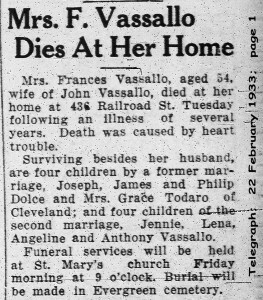 Francesca’s husband, Francesco Dolce, was killed in a railroad accident in 1904, leaving Francesca a widow, with four children, all under the age of seven.